The Continuing Committee is proud to announce the release of The Gamma Quadrant, the third and final standard-size expansion of the Deep Space Nine block. This fifty-four (54) card expansion will release for free on Friday, January 30, 2015 and will be legal in all constructed formats one week later. With the release of this expansion, we will give First Edition players new tools and new tricks to use when venturing beyond the Bajoran Wormhole. As has become tradition, I'd like to spend a few moments introducing the design team that worked on The Gamma Quadrant before we delve too deeply into what you'll see inside this expansion. The Gamma Quadrant is my ninth time as the lead of a First Edition expansion, and my eleventh overall. Though this won't be my last lead, I will be taking the reigns less and less as our design team expands more and more. A greater diversity of perspectives and experiences will lead to more and more high quality work. That being said, I'm happy to have had the chance to lend my experience to this expansion, and am proud of the work done within. This is Jason's second tenure as a member of a design team; in an interesting quirk, this is both his second time working with me and his second time working on the third set of a block. Jason is an experienced high level player that brings great insight to his designs, and The Gamma Quadrant is better because of it. Andreas is a very skilled player known for his interest in, and success with, the Dominion. Over the past several years he's written a five-part article series introducing and explaining how the Dominion have been played in First Edition. Andreas waited very patiently for his opportunity to work on a Dominion-focused expansion, and he was able to contribute in several positive ways to the quality of The Gamma Quadrant. If you'd like to read Andreas' Dominion Basics series, you can find it here: Part 1 - Part 2 - Part 3 - Part 4 - Part 5. As a fun side note: Jason Drake won the 2014 World Championship while working on this team. As Andreas was already a World Champion (having won the 2010 Worlds), I might be the first lead designer to have the privilege of having a team made up entirely of World Champions. Finally, I would be negligent if I failed to mention the hard work of the dozens of volunteers that work on First Edition. Kudos to all of our play testers, rules guys, creative team members, our Art team, and the man that is learning to keep us all on track: First Edition Brand Manager, Cristoffer Wiker (Smiley). All of our volunteers do so much work and all deserve significant recognition for making this game thrive. If you appreciate the hard work of all of our volunteers and enjoy having this website available as a hub for our community, we encourage you to make a donation to our operating costs today. Without the support of our community, this site wouldn't exist! The name of this expansion, The Gamma Quadrant, is very fitting. This expansion is about the far side of the Bajoran Wormhole, and the threats and opportunities one can find there. But while that central idea has been present throughout this entire expansion's development, its contents have shifted over its development. I hope you will find it interesting as we talk about where this expansion began before we talk about where it ended up. We discovered during the development of the Next Generation block that, in order to build more cohesive blocks, we needed a lot more planning and to work further ahead. For example, The Next Generation: Supplemental had almost nothing that could be used by the later expansions in the blocks. While planning out the Deep Space 9 block, we knew that we would need to do a lot more work ahead of time to ensure we could better use the reprint file that would become Emissary: Supplemental. So while we were planning out the entire Deep Space 9 block and doing early work on Emissary, we took the step of building first drafts of all four (4) starter decks. Designing the intial drafts of the starters this early in the process has several advantages, aside from the ability to better plan and use the Supplemental files. Most importantly, we have the chance to balance the starter decks against each other, both in terms of speed, relability, and dilemma combos. It allows us to spread out the cards across the block, so that the initial expansions of the block don't have to include cards needed by the later expansions. And this kind of planning also makes it easier to include the overlaps and shared mechanics we like to include in the starter decks. However, the disadvantage, at least for the starters associated with the later expansions, is that a lot of work is done very, very early. It's not as if these early starters are carved in stone and unchangeable, but it does set a lot of precedent that later design teams must deal with. For example, once the cards are selected for the block's supplemental file, those are locked in - they're all the later team has to work worth, even if things change. At the time we were designing these starters, there was some debate about what the fourth starter, the one associated with this expansion, would contain. The original plan was Dominion, and our design team felt strongly that this would not only be the players expectation, but that it would be a new and different option. 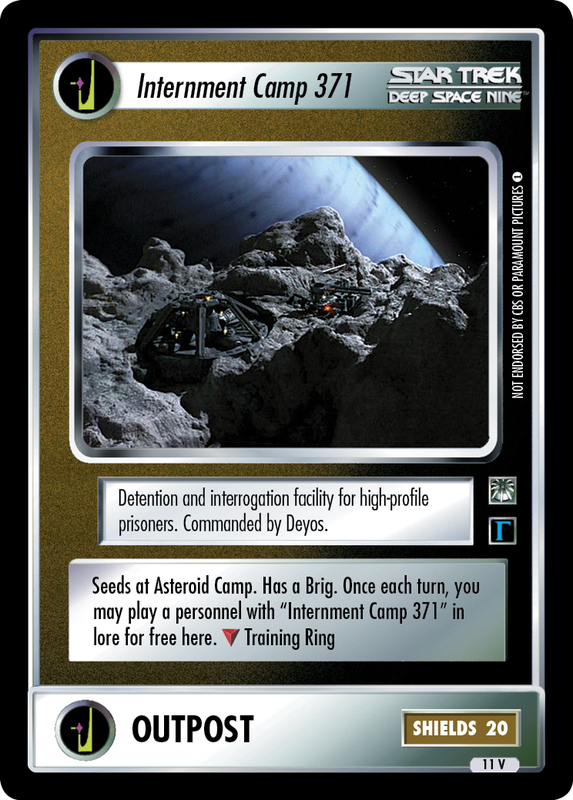 The problem we were running into was that our block was focusing on the early years of Deep Space 9, prior to the outbreak of the Dominion War, and there was concern this would leave the Dominion starter deck with no "star power" and very little material to draw upon. A compromise was reached, and we put together a Dominion/Ferengi starter deck focused around the trade treaties between those powers in the early seasons of DS9. Initial starter testing with that draft proved fine, but there were several problems. 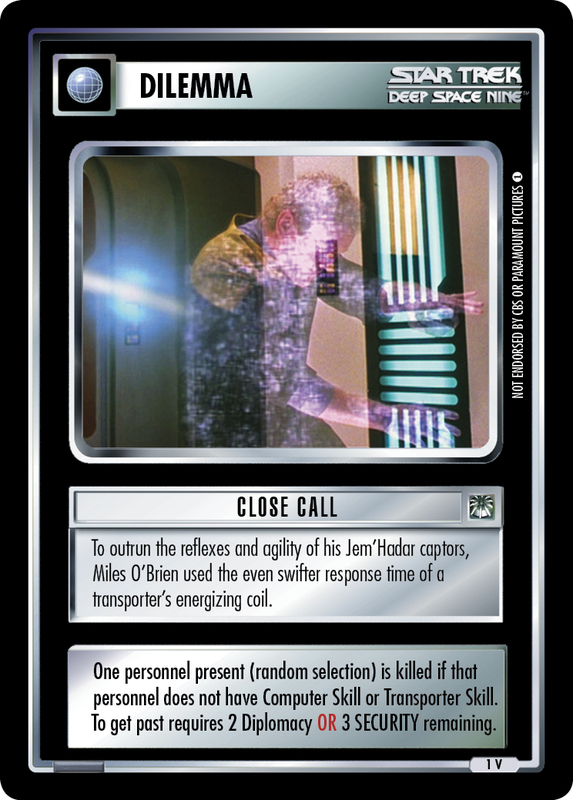 First, there were a lot of concerns about the Treaty: Dominion/Ferengi card we'd created for starter testing being too strong in Complete play. A valid concern, but one we could address during development. Secondly, there was a lot of resistance to using Ferengi as a key component of a starter deck for the second block in a row. A large part of this was the way the starter was layed out meant it was mostly Ferengi with a few Dominion. Finally, there was still a lack of "star power" in the deck. We had several problems to tackle, but the window of time for starter testing was over, so we had to make a decision. To hedge our bets, we included both Dominion cards and Ferengi cards in Emissary: Supplemental and left the details up to this expansion's design team. Let's set aside the starter deck (for now) and talk about the rest of The Gamma Quadrant. As mentioned, the name of this expansions tells you a lot about what you need to know about its contents. One of the original goals of the block was to make First Edition's Gamma Quadrant relevant to modern gameplay. Though there were bits and pieces of that in Emissary, there are a lot more here in The Gamma Quadrant. You'll find new missions, new incentives to venture out, and cards that enable new decks - and of course, the natives of the Gamma Quadrant. And the most well-known denizens of the Gamma Quadrant are the Dominion, who are represented in force in The Gamma Quadrant. Solving the problems of the Dominion starter went hand in hand with figuring out how to represent the Dominion "at home." Most, if not all, of the existing cards and strategies for the Dominion represent their efforts to conquer the Alpha Quadrant. We asked ourselves, 'What would the day-to-day life of the Dominion be like?' 'How would the Dominion operate if contact with the Alpha Quadrant hadn't been accelerated via the Bajoran Wormhole?' 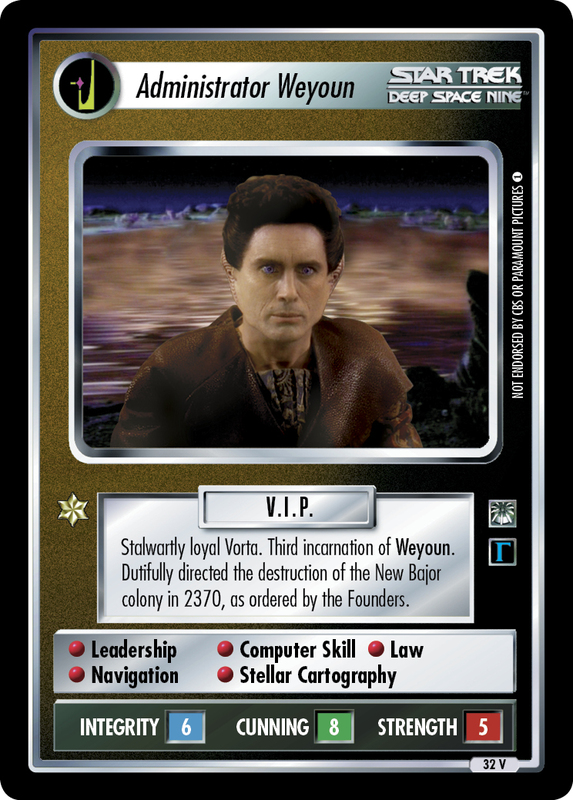 Thinking about those questions led us to focusing on different aspects of the Dominion, and led us to the creation of new versions of existing Vorta, such as Administrator Weyoun. These "new" versions of the Vorta personas represent the Vorta prior to the discovery of the Wormhole, during their ordinary roles running The Dominion on behalf of the Founders. It's a bit of conjecture, but a reasonable one. Most of the Dominion cards in The Gamma Quadrant explore this theme - most, but not all, as you will see during the second week of previews. Meanwhile, we wanted to represent the curiousity and opportunities that the far side of the Wormhole represented for the native species of the Alpha Quadrant. To start, we knew we needed to provide more missions for the Alpha Quadrant powers to attempt as they ventured into The Gamma Quadrant. 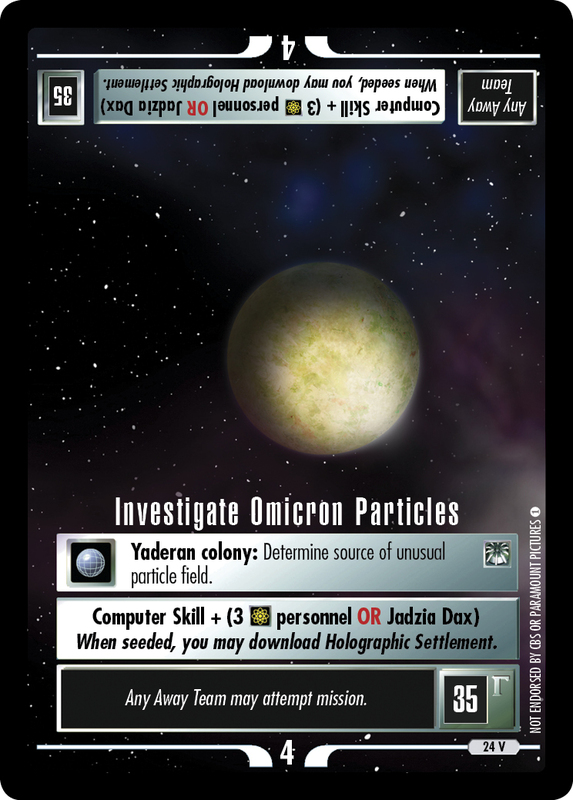 Investigate Omicron Particles is one such mission (and one of four new missions). If you aren't familiar with the story behind this mission, it comes from DS9's Season 2 episode "Shadowplay" in which Odo and Jadzia discover an artificial colony of holograms created by Rurigan. Exactly how that's represented in First Edition must remain a mystery for now, but rest assured - it won't remain a broken link for long. One of longer running storylines during the early years of Deep Space 9 involved the Ferengi and their business ventures into The Gamma Quadrant. Grand Nagus Zek was savvy and his information suggested the real power was known as the Dominion; he brokered deals with the Dosi and the Karemma to get more information and get ever closer to the real opportunities. These business opportunities will be well represented, both from the Ferengi point of view and the Dominion perspective as well. The new Ferengi Freighter will serve Ferengi business interestes well, and you'll learn more about these opportunities during the third week of previews. Finally, it should be noted that not everyone in the Alpha Quadrant looked eagerly beyond the Wormhole. Enabrain Tain knew that The Dominion was a significant threat, and he took steps to deal with that threat. The Tal Shiar / Obsidian Order alliance is one of my personal favorite storylines, and I'm happy to reveal that it's well represented in The Gamma Quadrant. You'll be able to pair up the Cardassians and the Romulans, build a fleet and a network of spies, establish secret facilities, and venture forth to confront your enemies. Hopefully, your efforts will end up better than Enabrain's did; after all, he Underestimated the Founders to disasterous results. You'll see more about this deck this week. The Gamma Quadrant brings a close to the Deep Space 9 block and the story of the early years of the titular space station. Beyond the Wormhole, there are as many opportunities as their are dangers, and we invite you to explore them with us. No matter if your interests are scientific, commercial, politicial, diplomatic, or militaristic, there is something for you in The Gamma Quadrant. Join us daily for spoilers over the next three weeks, leading up to the expansion's release - for free - on Friday, January 30th. In the mean time, may you live long and prosper - and may you escape the notice of the Founders.